The latest addition to Nikon’s expansive DSLR line, the 16 megapixel D5100, fits neatly between the entry-level D3100 ($700 with kit lens) and the more sophisticated D7000 ($1200 body only). An update to the 12 megapixel D5000, this new $800 model offers some features that may entice current D5000 owners to upgrade, including full 1080p HD video, a bigger and better articulating LCD screen, larger burst mode capacity, expanded ISO, full-time autofocus in video and Live View, and special effects for still and video capture. As expected, the D5100 employs manual, semi-manual, and auto exposure modes, along with 16 scene modes. Nikon’s Picture Control, presets for Landscape, Monochrome, Neutral, Portrait, Standard, and Vivid, with adjustable sharpness, contrast, brightness, saturation, and hue can be used in conjunction with program auto, semi-manual, and manual modes for fine-tuned image capture. Automatic distortion control, Active D-Lighting (which helps maintain details in shadows and highlights), Long Exposure, High ISO Noise Reduction, Multiple Exposure, Interval Shooting, and a new HDR (High Dynamic Range) mode are among the included standard options. The D5100 is slightly smaller and lighter than its predecessor, measuring 5-by-3.8-by-3.1-inches and weighing 19.7 ounces (body only), and its body is well-balanced and comfortable to hold. As always, it’s recommended that you budget for the highest quality lens you can afford for the best results. However, the D5100 doesn’t have an AF motor, so you’ll need an AF-S lens with a built-in motor to use autofocus. The D5100 is, for the most part, easy to operate. Most—but not all—controls are clearly labeled and make sense for anyone who has used a DSLR. Unfortunately, there’s no dedicated ISO button, so it might make sense to program the Function button for ISO adjustments—it’s more efficient than using the interactive LCD menu to make changes. Nikon has added a convenient Live View lever adjacent to the mode dial, and has positioned the red direct video record button within easy reach near the shutter release. Be careful around the 4-way multi-selector pad on the rear panel; it’s great for manually selecting focus points but accidentally depressing the selector will move the focus point when you’re not looking. Adjustable LCD screen: The new, 3-inch, high-resolution (921,000 dots) vari-angle LCD screen is a huge improvement over the D5000’s monitor. Size and resolution have increased and the LCD is now side-hinged (versus bottom hinged), providing more flexibility for video and Live View shooting. The LCD can also be folded into the camera body to protect the screen. Low light shooting: Like the D7000, the D5100’s native ISO ranges from 100 to 6400 and is expandable to 25,600, versus the D5000’s native 200-3200 that was expandable to 100 and up to 6400. Despite the D5100’s additional megapixels and increased ISO options, the camera handles image noise very well when shooting as high as ISO 1600—with and without the built-in noise reduction. As with the D7000, shooting in Raw mode and processing the image in Adobe Camera Raw delivers the best results. Nikon has added some new special effects to the D5100, including a Night Vision mode that, appropriate to its name, boosts the ISO to 102,400. It’s black and white only and, of course, there’s significant noise, but it’s usable if there’s a little light and you need a stealth mode. Special effects: The inclusion of special effects in the D5100 is not a groundbreaking addition but adds some fun and creativity to the camera. In addition to Night Vision, there’s a Miniature effect that simulates a tilt-shift lens and can make objects look like small models and scenes like dioramas. Color Sketch is self-explanatory and Selective Color converts an image to black and white but retains up to three user-selectable colors. Live View must be enabled to set up the special effects but once options are selected, images can be shot using the viewfinder. Special effects can be activated during video capture as well. And, except for Night Vision, the new effects can be applied to still images in playback (retouch menu), along with others such as Fisheye and Color Outline. A copy of the adjusted image can be saved so the original is unaffected. Video mode and Live View: The D5100 now offers full HD video, with multiple options: 1920 by 1080 at 30fps or 24fps (frames per second), with two quality (high and normal) settings for each. The same four fps and quality options are available for 1280 by 720 video capture. A lower resolution video of 640 by 424 at 30fps can be shot at high or normal quality as well. Full-time autofocus is available in both video and Live View modes, and while both are generally more responsive than other competitive DSLRs, neither is lightning fast. The D5100 produces excellent still images, particularly when manual controls are used and the appropriate Picture Control settings are selected and tweaked. Natural-looking but well-saturated colors are the norm, and exposures, even under challenging conditions, are almost always accurate with good dynamic range. The latter is often made even better by implementing Nikon’s D-Lighting. Even with the bump in megapixels from 12 to 16, the D5100 can easily handle the new, expanded ISO range without much strain, all the way up to ISO 1600. When in doubt, raw capture and processing will help keep image noise to a minimum and details intact. The AF-S 18-55mm VR lens bundled with the camera ($900 for the kit) is capable of producing surprisingly crisp images for a kit lens. Chromatic aberration was often visible, however, along high contrast edges. In our lab's subjective image tests, the D5100 earned a word score of Very Good for exposure, Good for both color and sharpness, and Superior for distortion. Click on any of our lab's test images to view them at full size. Video quality didn’t disappoint either, producing footage that equals or exceeds that of other DSLRs in its class. In our subjective lab tests, the D5100 earned a word score of Good for video quality and Fair for audio quality. Colors were pleasing and videos were generally sharp—once the D5100’s autofocus locked in. Shutter roll may occur when panning quickly but that’s not unique to the D5100 and, overall, the camera produced some solid video. Audio quality is good and although we didn’t have one to test, the ME-1 stereo microphone ($180) should be beneficial if you’re serious about capturing live sound. In addition to our tests, check out this month’s D5100 commercial staring who else but Ashton Kutcher. The commercial, which you may have seen on TV, was filmed with the D5100 in full HD. Sure, it’s a marketing thing, they used a full, professional rig along and the Director of Photography was Matthew Libatique, ASC (Black Swan, Iron Man), so we may not be able to reproduce this type of quality. But it’s certainly a great example of what this camera can do. The Nikon D5100 is a solid option for photographers looking for a highly-capable yet (fairly) user-friendly sub-$1,000 DSLR. Although it doesn’t have all the bells, whistles, and speed of the D7000, the D5100 delivers an excellent feature set and image quality that rivals or exceeds the competition. Current D5000 users may very well want to step-up to the new model thanks to a number of notable improvements. 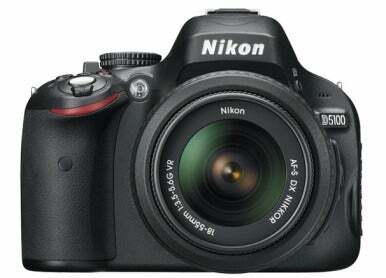 The D5100 is available body only for $800, or packaged with a kit 18-55mm lens for $900.